Built-in 10 Gigabit, enterprise-class Layer 3 including IPv6, flexible stack with GSM72xxPS / GSM73xxS. 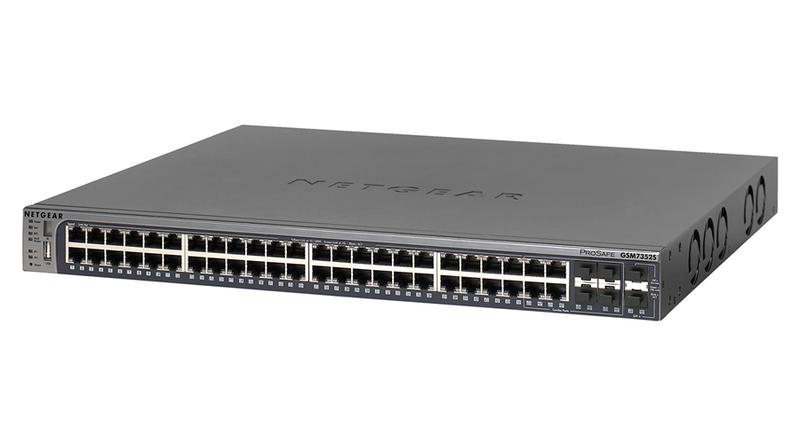 The NETGEAR Stackable Gigabit Managed Switch, the and GSM7352S allows the most flexible and easy-to-deploy Gigabit infrastructure. All 48 ports of 10/100/1000 Mbps interfaces deliver maximum throughput and low latency. Four (SFP) Gigabit interfaces provide optional fiber connectivity for longer reach Gigabit Ethernet requirements. Two built-in 10 Gigabit Ethernet SFP+ interfaces on the front, and two 10 Gigabit module bays on the rear, permitting both uplinks and local/distant stacking, provide versatile 10 Gigabit deployment possibilities. Enterprise-class L3 Combining superior resiliency, enterprise-class security and non-blocking performance, the GSM7352S offers IPv4/IPv6 dynamic routing protocols such as OSPF, VRRP and multicast for converged applications with unsurpassed affordability. Together with VLANs routing, voice-class prioritization, and chassis-like stack with Layer 2+ PoE GSM7228PS / GSM7252PS or high-density fiber L3 GSM7328FS, the GSM7352S series can be deployed at the enterprise edge, remote branch offices and closer to the core of small and medium-sized businesses' growing networks. High Availability The NETGEAR Stackable Gigabit Managed Switches, the GSM7352S comes with a removable power module for the main power supply. In the event of a power supply failure, the switch can immediately shift to an external RPS device while the internal power module is replaced for 100% uptime. Like all NETGEAR ProSafe Managed Switches, the GSM7352S is backed by the NETGEAR ProSafe Lifetime Warranty.